A further refinement of the horn, the broadcast seeder hangs by a strap over the shoulder. Seed in the canvas bag or metal hopper flows through an adjustable hole in the bottom onto a distributing fan which is powered by a hand crank. The fan spreads the seed evenly over the ground. Adjustments let you alter your seeding rate to suit the crop. But remember that the speed with which you walk and turn the crank will also vary the seeding rate considerably. You have to learn to walk and crank uniformly and then match the seeder's adjustments to your motions. Cyclone and Universal are two popular brand names available from most hardware stores and country catalogs. Models are light- or heavy-duty, the former for sowing seed only, the latter for spreading fertilizer and lime. Don't try to spread fertilizer with the lighter models, though. Much larger broadcasters pulled behind a tractor and powered by a power take-off shaft are capable of extensive broadcast-planting coverage. This is a triple-gear, adjustable sower with a self-feeding, oscillating feed plate. Equipped with a wide shoulder strap, an 18- by 6i/£-inch hardwood base, and spring stop, it is \0i/2 inches in diameter and weighs 5 pounds. It broadcasts all kinds of seed and is readily available through mail-order catalogs and hardware stores. This is « settler with a double-feed flow to sow any kind of seed to be broadcast, it has an automatic feed flow which can be adjusted for any amount of seed per acre. Features include a wide shoulder strap, ., 7- by 14^4-ttuh hardwood base, a four-sectt. i distributing wheel I0i/2 indies in diamc.c, and a self-agitating feed plate- The seeder has a capacity of i/g bushel and is readily available through mail-order catalogs and hardware stores. A rotary agitator whirls material out to cover up to a 15-foot-wide swath depending on the density and particle size of the material being spread. It comes with an adjustable spreading rate gauge, spring load, trigger action on-off switch, die-cast metal gears, and measures 101/2 inches high with a 9-inch diameter. Cyclone also has a hand-pushed, broadcast seeder-spreader which is popularly used for spreading fertilizer. It is accurate in ounces or pounds per 1,000 square feet. A tapered-edge spreader eliminates skips and double overlaps. It comes equipped with micro dial settings for light, medium, or heavy applications, 8-inch wheels, T-bar handle, and a galvanized steel hopper. This seeder is easy to find in any hardware store or country catalog. The Geiger Casoron is a rigid, rust-resistant unit weighing 3 pounds. The Casoron spreader can spread or seed at a rate of from 50 to 500 pounds per acre. The flat base keeps the unit from tipping while filling. An adjustable control varies the swath width from 3 to 12 feet. The unit comes with a wide shoulder strap and a lubricated gearbox, sealed for protection. Small row planters mount the seed box on one or more wheels which not only carry the seed box but activate a disc or plate, as it is called, in the bottom of the seed hopper. As the plate moves around, it allows the seeds to fall through the planting tube into the soil at regular, uniform spacings. In the simplest type of * ow seeder available, for example, the Plant-R tc and Dial-A-Seed seeders, the wheel is the planting disc. The smallest two-wheel seeder with changeable discs for different planting intervals is the light Esmay seeder, which is regularly advertised and sold through catalogs and garden stores. 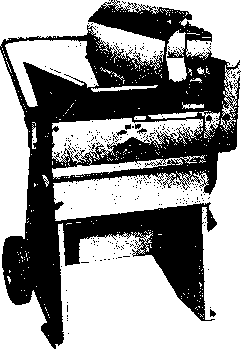 A little larger and heavier, with a larger choice of planting depths and plates, ate the Lambert, the Planet Junior, and one from Danville Manufacturing Co., Danville, IN 46122 (sold by Sears). There are probably others.